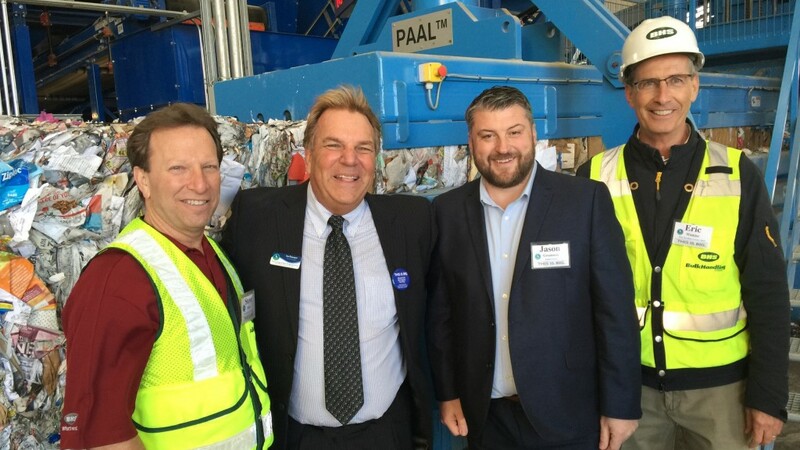 From left: Steve Miller, CEO BHS; Tim Flanagan, GM of the Monterey Regional Waste Management District; Jason Greatorex, U.S. leader of Kadant PAAL; and project leader Eric Winkler of BHS. The district's new multi-material line processes 30 tph of commercial and residential single-stream or 40 tph of commercial mixed materials, while the C&D line handles 40 tph. The $24 million project occupies 100,000 square feet of the Monterey District's campus, which also includes the country's first SMARTFERM anaerobic digestion (AD) system. According to the facility's District General Manager, Tim Flanagan, "Our MRF improvement project positions the District and its member agencies to achieve new levels of success by turning even more waste into resources for the next 20 years." The Kadant PAAL Konti channel baler provides Monterey with the flexibility to handle a broad range of materials. For maximum flexibility and throughput, the Monterey facility is using a Kadant PAAL Konti baler, the first of its kind in America. Paper, plastics and cans are neatly baled and tightly compressed for efficient shipment all over the world. According to Jason Greatorex, who leads Kadant PAAL in the U.S., "Our PAAL Konti channel baler plays a critical role in creating value at the Monterey facility. All bales are made with a single unit. Well-formed bales deliver greater value for their next life and a greater return for our customers. Because more bales can be loaded onto a single container truck, transport costs are much less. "The PAAL Konti channel baler is the European market leader because of its flexibility and robustness to process a broad range of materials. When a facility runs continuously, and transportation costs are an issue, our solution delivers the highest level of profitability." "The Monterey Regional Waste Management District has been a longtime partner to BHS," adds BHS CEO Steve Miller. "Processing 80 tph is an achievement for any operator, but the District really shines because of its deep commitment to high levels of both recovery and product quality. Their leadership has the vision and systems in place to close in on a zero waste future." Monterey's multi-material line processes 30 tph of commercial and residential Single Stream or 40 tph of commercial Mixed Materials, while the Construction and Demolition line handles 40 tph. The project occupies 100,000 square-feet of the District's campus, which includes the SMARTFERM anaerobic digestion (AD) system. According to Kadant PAAL, this first-of-its-kind system on California's Central Coast will provide the regional building industry with compliance for the CalGreen 65 percent diversion mandate for new construction. It will also provide the incremental diversion necessary for the surrounding community to meet the state's 75 percent recycling goal by 2020.